The Intel Artificial intelligence (AI) will reach into nearly all domains of computing. None more so as where human-computing interactions will be at its most critical, especially AI on PCs. This webinar introduces attendees to the challenges and opportunities presented to AI practitioners regarding inferencing on PC devices where CPU and integrated GPU resources can be readily exploited for their usages. An introduction to the Intel® Distribution of OpenVINOTM and the Microsoft* Windows Machine Learning ecosystem will be presented to the attendees so as to get up to speed as quickly as possible on modern mechanisms that enable developers to create and deploy deep-learning inference applications on PCs in a straightforward manner. 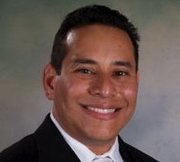 Rudy Cazabon received his Bachelors degree in Space Science (minor in Mechanical Engineering) from the Florida Institute of Technology; with graduate studies in Aerospace and Astronautics from Georgia Tech and Management Science from Stanford. Rudy has served as engineering manager and architect on projects such as Autodesk 3DS Max*, Havok StudioTools* and more. Rudy has extensive experience 3D graphics, VR, and computer vision and is an active volunteer in STEM K-12 programs and participates in academic venues such as ACM Siggraph.